Duffy’s Napa Valley Rehab is one of the top alcohol and substance abuse treatment providers in Northern California. It has been offering premier treatment services since 1967 and is trusted by 38,000 families so far. The mission of Duffy’s Napa Valley Rehab is to help individuals and families break the bonds of addiction and find hope and recovery in the process. This is achieved through a structured environment, physical nurturing, and life skills development education for clients. The core values that are upheld at the rehab center are transparency in service, principle-based guidance, strategic operations, honesty and integrity, respect and dignity, and excellence in service. The center offers detoxification, residential program, and long-term recovery programs. The treatment programs utilize evidence-based therapies such as Dialectical Behavioral Therapy (DBT) and Cognitive Behavioral Therapy (CBT). The 12 steps philosophy is deeply rooted in the treatment approach with regular AA meetings held at the campus. Clients are provided with a strong foundation of knowledge which helps them break the chains of addiction and develop the resilience to prevent relapse in the future. Through the continuing care and aftercare services, clients are empowered to achieve recovery and maintain it throughout their lives. Duffy’s Napa Valley Rehab is located in the beautiful Napa Valley which is less than two hours from San Francisco and Sacramento. The facility offers a relaxing and comfortable setting to clients where they can focus on the healing of the mind, body, and spirit. Residents are provided luxurious private and shared accommodations. The rooms are furnished with beds, side tables, lamps, dressers, desks, chairs, and closets. Each room has an attached bathroom with luxurious amenities provided. A comfortable common room serves as a place where clients can watch TV and bond with each other. The center offers a number of indoor and outdoor recreation activities for clients. Indoor activities include Wii video games, TV, computers with internet, board games, yoga, tau chi, and a fitness room. Outdoor activities include a luxurious swimming pool, walking trails, grotto, tennis courts, basketball courts, volleyball, horseshoes, ping pong, and baseball. The center has in-house chefs who prepare healthy, fresh, and delicious meals for clients three times a day. Clients are also provided with a snack before bedtime. Meals are served in the dining hall where all residents eat together in a beautiful and family-like setting. Special dietary restrictions or food allergies of clients are also accommodated in meal preparations. 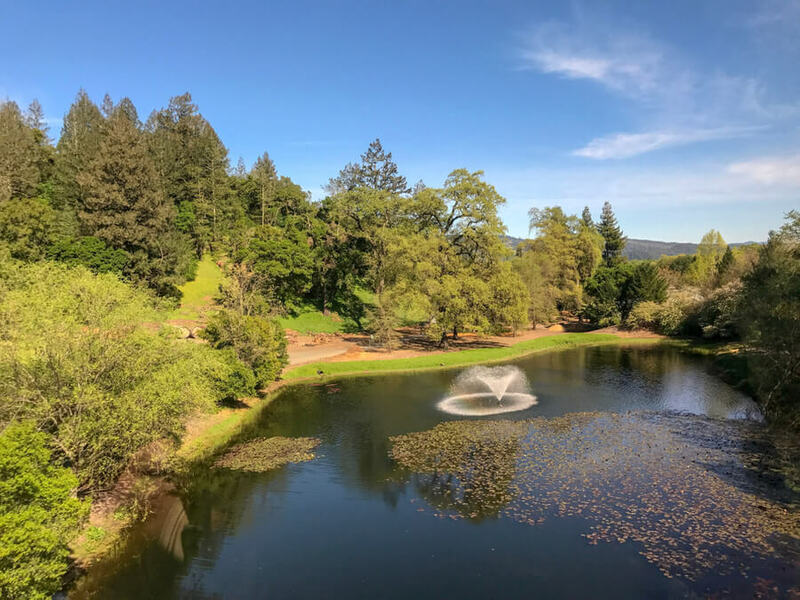 Duffy’s Napa Valley Rehab was established in 1967 and since then has helped thousands of individuals and families find hope and recovery from addiction and chemical dependency. The center has a success rate of 90% which is achieved through an integrated approach of treatment and a complete continuum of care. Clients are provided with life-changing education and guidance which helps them break the bonds of addiction. They are able to experience the hope and promise of a healthy and sober life. The multidisciplinary staff of healthcare professionals at the rehab center are extremely trained and experienced in their respective fields. With a staff-to-client ratio of 2:1, the center ensures that each client is provided with the best and personalized care during their journey of healing. Through a nurturing, supportive, and encouraging environment, each client is empowered to leave their addictive behaviors and adopt a healthier lifestyle resulting in lifelong recovery. Dr. Bourne has a Medical Degree from the University of California, San Francisco. She completed her residency in Family Medicine at Stanford University. She is double board certified in Addiction Medicine and Palliative Care. She has over 25 years of experience working in the healthcare industry. Before joining Duffy’s Rehab, she served as the Chief Medical Officer at Hospice by the Bay. Elliot has a BA in Psychology from Sonoma State University. He earned his Master’s degree in Cognitive Neuropsychology from Oxfords Brookes University. He joined Duffy’s rehab as part of the clinical team in 2013 before being promoted to the Clinical Director in 2016. He manages the Continuing Care Program at the center and supervises the Incidental Medical Services. Nola earned her Bachelor’s degree in Human Ecology from Cornell University and her Master’s degree in Counseling Psychology from Pacifica Graduate Institute. She is a Licensed Marriage and Family Therapist. Her areas of expertise include attachment focused neurobiology, trauma, couples counseling, and addiction recovery.